I hope this email finds you well and happy. This message serves to inform you that the Winter 2018 semester of the Institute for Contemporary Buddhist Ministry (ICBM) is scheduled to begin courses on February 12, 2018. 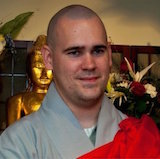 The Institute for Contemporary Buddhist Ministry (https://buddhistmininstry.org) is a non-profit, educational program and institute, specifically designed for Buddhist spiritual care, chaplaincy, and contemporary Buddhist ministry & teaching. All new ICBM students must complete ICBM’s application process (free) and be admitted before registering for courses. The deadline for new applications is January 15. Tuition rates for the Winter 2018 semester are $100 USD/course. These courses are peer-driven and operate asynchronously online through our own private Moodle platform, so students can work and progress at their own pace. Please get in contact with me directly at bupmee@gmail.com or head over to https://buddhistministry.org/contact to drop us a line. Good thoughts and wishes for a healthy and happy New Year! Thank you for your time and looking forward to hearing from you soon!